In almost all cases Salvia divinorum is cultivated from cuttings, because the plant very rarely produces viable seeds. Even in the wild the plant usually propagates by falling over and producing new roots. Cuttings are readily available on the internet. Some sites offer cuttings whose roots are put in agar as a substrate. It is important that you rinse of the agar (a jelly-like substance) before putting the cutting in potting soil. The first couple of weeks the small plant needs to root. 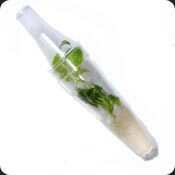 During this period it is advised to put a glass over the plant for extra humidity. After the plant has rooted, it can be grown as described below. Salvia can be easily grown indoors in any climate. Growing salvia outdoors is only possible in the appropriate climate: Salvia prefers a humid semi-tropical climate, well-drained rich soil. The plant doesn’t tolerate frost or drought. It is possible to grow Salvia outdoors in pots, as long as those pots are brought inside when temperatures go below freezing. 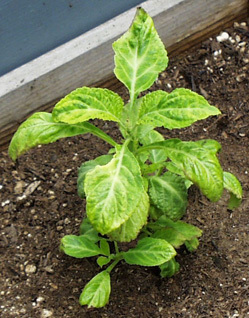 Salvia divinorum doesn’t like cold, and temperatures below zero can prove fatal. As nights become colder, the leaves will start to blush red. This is the sign to put your plants inside. In most cases, placing your plant in a windowsill with some light (but no direct sunlight) will do. Cut down on watering during this period. Salvia grows fine in most potting soils, with some fertilizer. It needs a lot of water. You will notice soon enough when it is time to water the plant: the leaves will start to droop. The plant needs humid, but well drained soil, so make sure that there are some drainage holes in the bottom of the pot. Salvia does not necessarily need a lot of sunlight, but it prefers at least a couple of hours of indirect sunlight per day. Salvia, and specifically the roots, needs a lot of room to grow, so make sure to put the plant in a larger pot, every time it seems to outgrow its old one. The biggest problems when cultivating Salvia are pests and rot. Insects, slugs etc. can usually be exterminated using a garden hose or plant spray. Do not spray too hard, as it will damage the leaves. Root and stem rot are most often caused by inappropriate drainage. Making your own cuttings is not a very difficult job, but it does require some knowledge about growing cuttings. The easiest way of making a cutting is by letting a branch root in water. Cut off a leaved branch of between 7.5 – 20 cm (3 to 8 inches) around 1.5 cm ( 0.6 inch) below a node. Cut of most large leaves, leaving only some small leaves. Place the branch in a glass filled with appr. 5 cm ( 2 inches of water). Place each branch in a separate glass! Place a clear glass jar (or clear plastic bag) over the plant to keep the humidity high. Place the glass in moderate sunlight. It is important to change the water daily. After around two weeks roots will start to appear. When the roots reach a length of around 1.5 – 2.5 cm (0.6 – 1.0 inch), they are ready to be planted in soil. During the first weeks keep the plants covered with a glass or plastic bag, until the plant is strong enough to survive without. The salvia divinorum grower’s guide on Erowid is another excellent source. It is advised to wait with harvesting until the plants are at least one year old. If you have several plants, you should harvest an equal number of leaves from each plant, so that the shock to one plant will not be too great. The most basic way of collecting leaves is to simply wait until they die and fall off. This puts the least strain on the plant, but you will need some patience. Drying leaves can be done by placing picked or naturally shed leaves on a plate in a dry room. It is also possible to cut up the leaves in 0.5 cm strips that you pile up. Turn the pile once or twice a day, until the leaves are thoroughly dry, but not crispy. A final and quicker method is to put the leaves on a dish and put them in an oven at very low temperature (under 70°C or 150°F). The process is ready when the leaves can be easily powdered by hand. Salvia doesn’t seem to lose much of its potency when stored for a long period: several months or even years. To ensure the quality of the salvia, it is advised to keep the leaves in a sealed jar, in a dark and dry place.